The bestselling, award-winning team of Yolen and Teague are back with another dinosaur tale--a fourth full-length picture book about how dinosaurs behave at school. 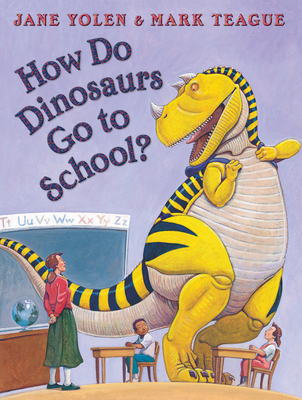 Everyone's favorite dinosaurs are back--and this time they are going to school. More fun dinosaur antics await. These prehistoric pupils are in a class of their own! As in their previous books, Yolen and Teague capture children's rambunctious natures with playful read-aloud verse and wonderfully amusing pictures. Jane Yolen is the beloved author of more than four hundred books for children and adults, including award-winning picture books, fiction, and poetry. Her How Do Dinosaurs books have sold millions of copies and are international bestsellers. She regularly travels the globe speaking and teaching. Jane lives in Western Massachusetts with her children and grandchildren, and she also lives in St. Andrews, Scotland. You can also visit her at www.janeyolen.com. Mark Teague is an award-winning children's book author and illustrator whose books include the NEW YORK TIMES bestselling How Do Dinosaurs... series, the LaRue series, FIREHOUSE!, FUNNY FARM, and many other humorous picture books. Mark lives in New York state with his wife and their two daughters.